The Vanguard Jazz Orchestra, hailed as “one of New York’s institutions” by the New York Times, brings its big-band swing to the Lawrence Memorial Chapel Friday, May 6 at 8 p.m. in the final concert of the 2010-11 Lawrence University Jazz Series. Tickets, at $22-20 for adults, $19-17 for seniors, and $17-15 for students, are available through the Lawrence Box Office in the Music-Drama Center, 420 E. College Ave., Appleton or by calling 920-832-6749. Featuring 16 of the world’s finest jazz musicians, the two-time Grammy Award-winning Vanguard Jazz Orchestra traces its roots to 1966 when cornetist/composer/arranger Thad Jones and drummer Mel Lewis founded a band in New York. Among its first bookings was a trio of Monday night gigs at the world-famous New York City jazz club the Village Vanguard. “When Thad Jones and Mel Lewis launched their jazz orchestra, they elevated the jazz big band to a new artistic level,” said Fred Sturm, director of jazz studies and improvisational music at Lawrence. “Thad’s playing and writing was an extension of the Count Basie swing tradition. Mel supplied the progressive West Coast style of the Stan Kenton band. The sidemen they hired brought the influences of playing with Basie, Miles Davis, Charles Mingus and Gerry Mulligan. The result was a remarkable funneling of the world’s premier jazz talents into an iconic large jazz ensemble. 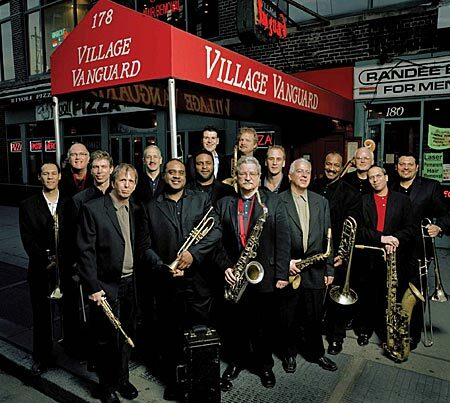 The VJO’S 2008 recording “Monday Night at The Village Vanguard” won a Grammy Award for Best Large Jazz Ensemble and earned Brookmeyer a Grammy nomination for Best Instrumental Arrangement for his work on “St. Louis Blues.” The VJO earned its first Grammy Award in 2004 for “The Way—Music of Slide Hampton” in the Best Arrangements for Jazz Orchestra category. Their 2005 recording “Up from the Skies,” featuring the music of McNeely, the ensemble’s pianist, composer and arranger, earned two Grammy nominations, including one for Best Jazz Ensemble. Today, the orchestra carries on the tradition established by Jones and Lewis by performing regularly at the Village Vanguard jazz club in Greenwich Village.